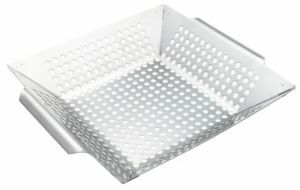 Perforated grill basket is perfect for assorted vegetables or small pieces of meat that might otherwise slip into the coals. You'll find both round or square shapes, with holes in both the bottom and sides. Also see Grill Basket, Flexible Grilling Basket.